Pratt & Whitney “No. IB Deep Hole Driller” mdl. M-1806 Twin Spindle Deep Hole Gun Drilling Machine s/n 219 w/ Guide Bushing Heads, 8” 3-Jaw Chucks, 150” Bed Length, Coolant. Pratt & Whitney mdl. M-1818 Twin Spindle Deep Hole Gun Drilling Machine s/n 357 w/ Guide Bushing Heads, 6” 3-Jaw Chucks, 110” Bed Length, Coolant. Drillmation Knee Type Gun Drilling Machine w/ Drillmation Controls, Mitutoyo DRO, Mega mdl. F12-1000 Coolant and Filtration System, 24” x 46 ¾” Cross Slide Table. El Dorado / Brown &amp; Sharpe mdl. M75-1013 ¾” Knee Type Gun Drilling Machine s/n 1254 w/ El Dorado Controls, Newall Sapphire DRO, Mega-Flo mdl. M3518 Coolant and Filtration System, 13” x 54 ½” Cross Slide Table. Brown &amp; Sharpe LMation ¾” Cap Knee Type Gun Drilling Machine s/n 511-1411 w/ Brown & Sharpe Controls, Newall Sapphire DRO, Mega-Flo mdl. M-3518 Coolant and Filtration System, 10” x 50” Table. El Dorado Mega mdl. M75-1041 ¾” Cap Gun Drilling Machine s/n 1878 w/ El Dorado Controls, Mega Type F18-1101 Coolant and Filtration System. El Dorado Mega mdl. M75-1041 ¾” Cap Gun Drilling Machine s/n 676 w/ El Dorado Controls, Mega mdl. F18-1101 Coolant and Filtration System. El Dorado Mega mdl. M50-1031 ½” Cap Short Stroke Gun Drilling Machine s/n 681 w/ El Dorado Controls, Mega F18-1101 Coolant and Filtration System, 12” x 14” Table. Miller Syncrowave 180SD CC-AC/DC Squarewave Power Source s/n LC319224. Pit Bull MIG-100 120Volt MIG Welder. Welding Torch Cart w/ Acces (NO TANKS). Caterpillar 40 mdl. GC20 4000 Lb Cap LPG Forklift s/n 4EM03427 w/ 2-Stage Mast, 130” Lift Height, Cushion Tires. Multiplex Handy Hoister Type CH 1000 Lb Cap Die Lift s/n 18090. Cadillac mdl. 1733 17” x 33” Geared Head Gap Bed Lathe s/n C58481 w/ 32-1800 RPM, Inch Threading,Tailstock, KDK Tool Post, 10” 3-Jaw Chuck. Comet mdl. 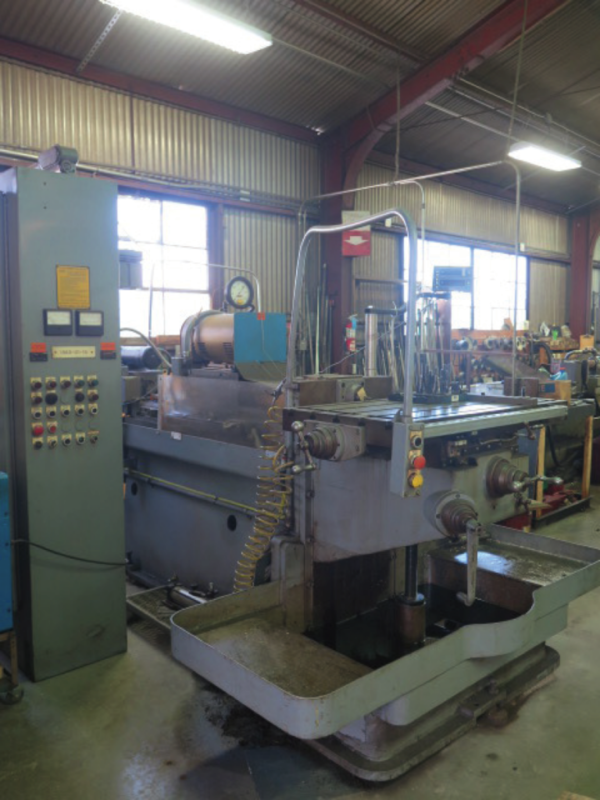 3KVHD Vertical Mill s/n 880650 w/ Newall Topaz DRO, 3Hp Motor, 60-4250 Dial Change RPM, Box Ways, Power Feed, 10” x 50” Table. Walter Tool and Cutter Grinder s/n 11684 w/ Compound Grinding Head, Motorized Work Head with 5”4-Jaw Chuck, 7” x 36” Table. Table Model Surface Grinder w/ 2 ¾” x 11” Table. Sunex mdl. 5250 50 Ton Cap Hydraulic H-Frame Press. Speed-Cut No. 20 20” Abrasive Cutoff Saw w/ Chain Clamp. Leonard “Grind-R- Lap” Oscillating Tool Grinder. Famco No. 4-R Arbor Press w/ Speed Wheel and Stand. Sunnen “Cylinder King” CV-616 Automatic Vertical Honing Machine s/n 3819 w/ Sunnen Automatic Controls, Fixture Mounts, Coolant. Sunnen “Cylinder King” CK-10 Automatic Cylinder Re-Sizing Machine s/n 3416 w/ Sunnen Automatic Controls, Fixture Mounts, Coolant. Sunnen mdl. MBB-1800 Automatic Precision Honing Machine s/n 73415 w/ Power Stroke Unit, 12-Speeds, Coolant. Sunnen mdl. MBB-1650MS Honing Machine s/n 53781 w/ 12-Speeds, Coolant. Sunnen mdl. MBB-1600 Precision Honing Machine s/n 44435 w/ 12-Speeds, Coolant. Mitutoyo PH-350 13” Optical Comparator s/n 9020 w/ Micrometer and Dial Indicator Readouts, Surface and Profile Illumination, Acces. J & L mdl. PC-14 14” Floor Model Optical Comparator w/ 6” x 30” Table. Sunnen PG-800- S Precision Bore Gage. Sunnen PG-500- S Setting Fixture w/ 1.5”-3” Finger Extension Set. (2) Sunnen PG-400- S Setting Fixtures. Sunnen CK-3280 2”-6” Dial Bore Gage. Sunnen 2”-8”, 1.08”-2”, .74”-1.19” Dial Bore Gages. Sunnen GR-6000 Series (3) .75”-1.190”, (2) .495”-.75” Dial Bore Gages. Sunnen CF-1126 2”-6” Setting Fixture. (2) Sunnen CF-502 0-2” Bore Gage Setting Fixtures. Brown & Sharpe Digit-Hite 24” Digital Height Gage. Cadillac Pla-Chek 24” Height Gage. Draper 18” Vernier Height Gage. Etalon 15” Vernier Height Gage. Microprocessor TM-8811 Digital Ultrasonic Thickness Meter. Starrett Height Block and Gage Block Sets. WGC Precision Air Bore Gage. Tumico 2”-5” Dial Bore Gage. Boice 1 ¾”-3” Dial Bore Gage. Fowler ½”-2 3/8” Dial Bore Gage. Mitutoyo .7”-1.5” Dial Bore Gages. Mitutoyo 12” and 6” Dial Calipers. Meyer Pin Gage Cabinets .061”-.750”, .751”-1.000”. Plug Gages and Handles 1.000”-1.500” w/ Cabinets. Rahn 36” x 48” x 8” 2-Ledge Granite Surface Plate w/ Stand. Precision 24” x 36” x 4.5” Granite Surface Plate w/ Roll Stand. 12” x 12” x 4” Granite Surface Plate.